Learning to distinguish between the different sea turtle species in Belize is easy! ​There are only three common species and two rarely sighted species. Hawksbill turtles can be distinguished by their 4 pairs of overlapping lateral scutes and hawk-like beak. They have 2 pairs of pre-frontal scales and can weigh up to 200 pounds. Their shell has the characteristic mottled tortoise shell appearance. Hawksbill sea turtles were once harvested for their shell which was used to make jewelry, eye glasses and other items from their shell which is known as tortoise shell. Juvenile and adult hawksbill sea turtles are found throughout Belize and reports received in the Sea Turtle Census indicate they are the MOST abundant sea turtle in Belize! Their favorite habitat is coral reefs where they spend the day looking for their favorite food - sponges! The scutes don't appear to overlap in hawksbill hatchlings but they will have 4 lateral scutes and the only other sea turtle that has four lateral scutes is the green (which have white along the edges of their flippers and also have a white plastron) so you can distinguish between the two. There are also 2.5 marginal scutes to the 1st lateral scute. 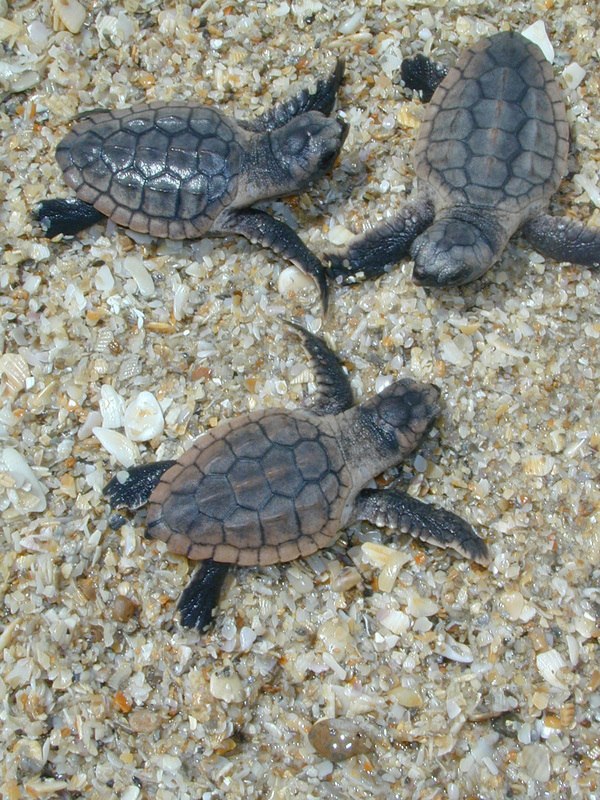 Hawksbill hatchlings have 4 lateral scutes and 2.5 marginal scutes to the 1st lateral scute. Hawksbill turtles have asymmetrical tracks when they crawl up on the beach. These are created because the turtle moves one flipper forward at the same time as the opposite side. This leaves behind asymmetrical or a 'zipper' of tracks. Hawksbill asymmetrical tracks typically have a width of 70-85cm. Adult female hawksbill turtle observed while diving Half Moon Caye Wall on Lighthouse Reef Atoll. Courtesy Gordon Kirkwood. According to Christopher Columbus "green sea turtles were once so abundant they covered the seas." Green turtles are actually named after the color of their fat which is probably attributable to all the sea grass they consume. Greens are the second largest sea turtle and can weigh up to 500 pounds. They can be easily identified by their 4 pairs of lateral scutes and single pair of pre-frontal scales. They can sometimes be confused with hawksbill turtles since their carapace is can be mottled like tortoise shell. The scutes of green turtles have a white line separating the scutes whereas the hawksbill turtle has overlapping scutes. Green turtle hatchlings are easy to identify by the white line that extends along the edge of their flippers and carapace. Adult greens have symmetrical tracks that have an average width of 100-130cm. These symmetrical tracks are made by the turtle pulling themselves up the beach by moving their front flippers forward simultaneously. 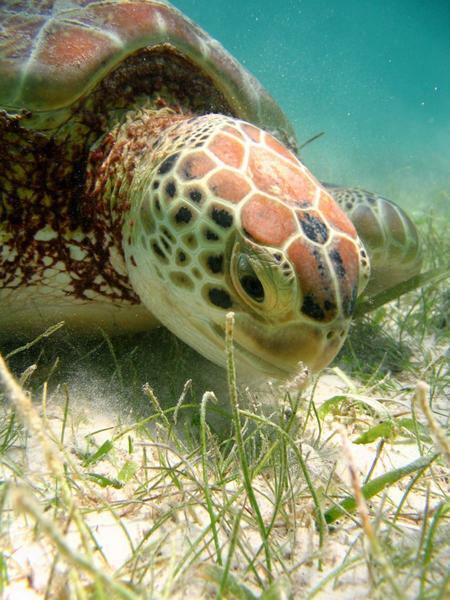 Green sea turtles are the vegetarians of sea turtles and eat what else, turtle grass! 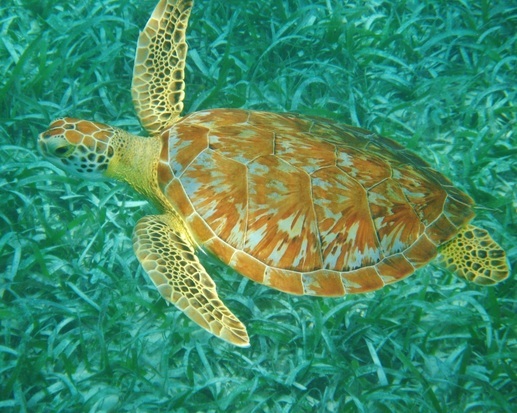 Juveniles and adults can be found on reefs and over seagrass beds throughout Belize eating turtle grass or manatees grass. Turtle grass has wide flat blade and manatee grass has narrow cylindrical blades. ​of more turtles sighted in Belize! 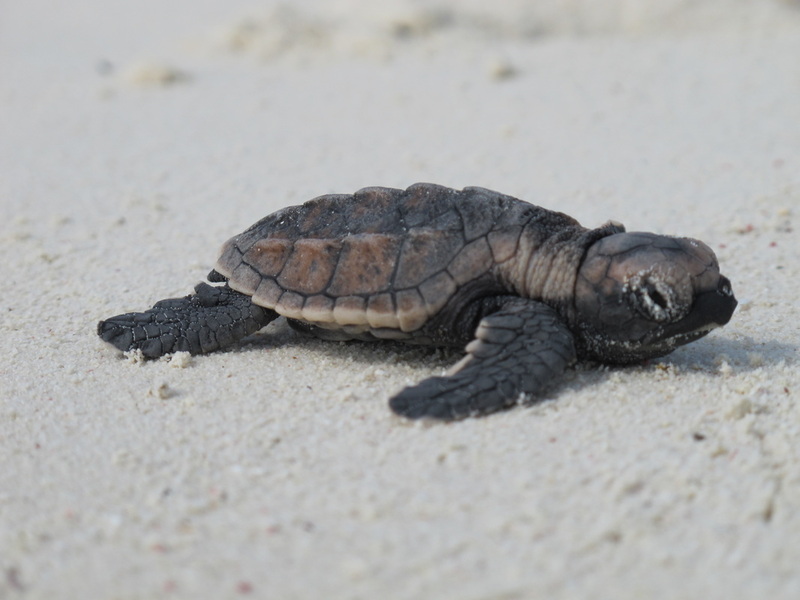 Juvenile loggerheads are not common in Belize so sightings of this size would be very important. Each year around March many divers report seeing more male loggerheads as it leads up to mating season. They are curious and even approach and size up divers but once they realize divers are not turtles they move on in their search of a female loggerhead as they have done for 100s of years. Loggerhead turtles can easily be distinguished by their large head. They can weigh up to 450 pounds and their shell can be up to 3.5 feet in length. They have 5 pairs of lateral scutes. 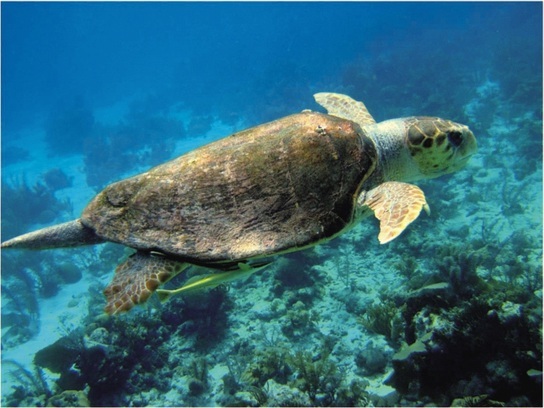 Adult loggerhead sea turtles are observed cruising coral reefs looking for crustaceans and mollusks. Even the loggerhead hatchlings have a big head, but to confirm you can count 5 lateral scutes on their carapace. 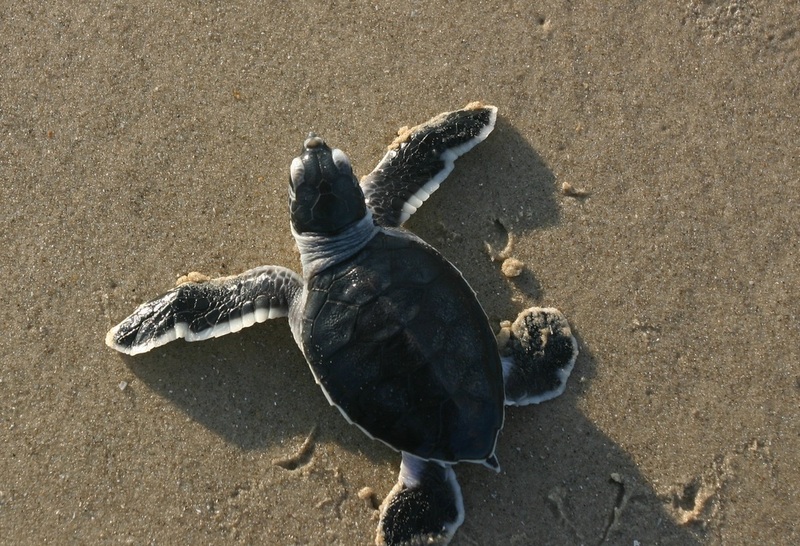 Like the hawksbill, loggerhead turtles make asymmetrical or zipper-like tracks when they crawl onto the beach to nest. However, they tend to be a bit larger on average than the hawksbill in width and since they are heavier produce a deeper body pit. 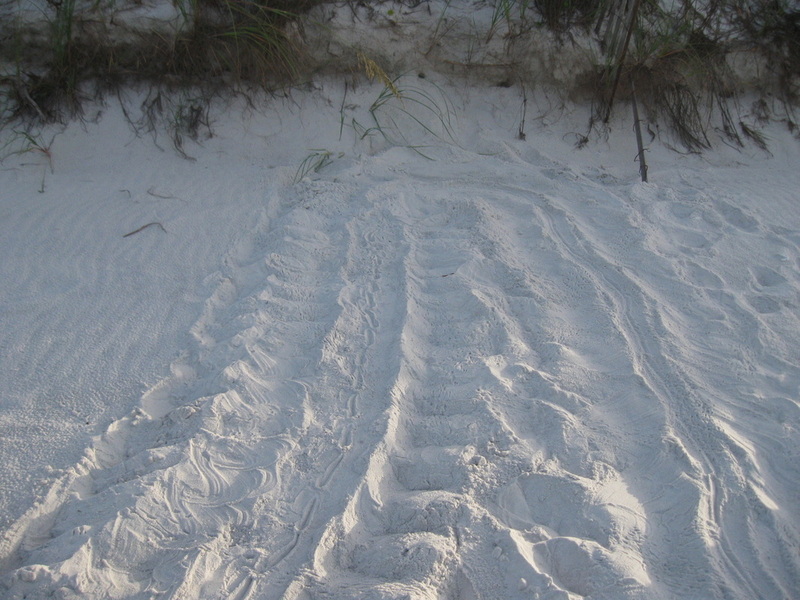 Loggerhead tracks average in around 80-90 cm and larger in width. ​Adult leatherback sea turtles are occasionally observed in the open ocean and in the Victoria Channel which extends along the coast of Belize from Robinson Point to Monkey River. There have been no confirmed nesting leatherback sea turtles in Belize as yet, but they nest in neighboring Mexico and Guatemala, so it is highly likely that they will also nest in Belize! Leatherback turtles are the only sea turtle that has a soft shell. They are the largest of all sea turtles and can weigh up to a ton and have shells of up to 8 feet in length! They are easily identifiable by their size, soft carapace and prominent ridges on their carapace. Leatherbacks swim through the open ocean and feed primarily on jellyfish. Leatherback turtles have symmetrical tracks like green turtles. However, it should come as no surprise that the width of leatherback turtle tracks is significantly larger than that of the green! 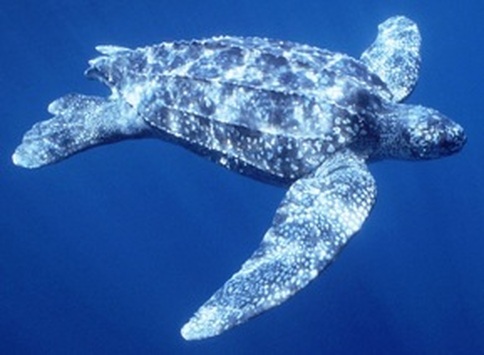 Leatherback turtles leave tracks that have an average width of 150-230cm and larger. It is unlikely there will be nesting ridley sea turtles in belize since they are known to nest in arribadas, where hundreds synchronize the time they nest, but they may be seen while snorkeling or diving, though unlikely, it is possible to good to be aware of these other species! The range of olive ridley turtles was not thought to extend to the waters of Belize but in early 2011, a stranded olive ridley was found floating in discarded fishing gear near Hol Chan Marine Reserve. She was rehabilitated and released 4 months later. Olive ridley sea turtles nest in arribadas, so if anyone witnesses several turtles nesting at one time please contact us immediately! Olive ridleys can be distinguished by the disk-shape of their shell. They are a small turtle weighing 75-100 pounds on average with a shell length of about 2 feet. ​Olive Ridley turtles have asymmetrical tracks that only measure about 70-80cm in width. Olive ridley turtles tend to nest during the day unlike the other species of sea turtles, which are seen nesting at night. Olive ridleys are omnivores that can be found near coral reefs and in the open sea. 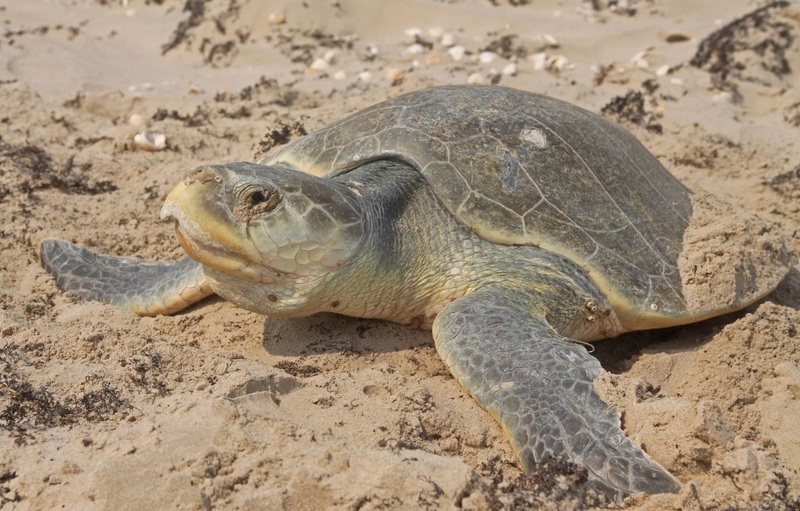 The Kemp's ridley is the rarest of all sea turtles and has not yet been confirmed in Belize. 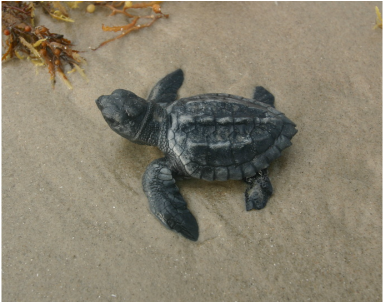 95% of all nestings of Kemp's ridley sea turtle occurs on the beach at Rancho Nuevo, Mexico just south of Brownsville, TX in the Gulf of Mexico, where they nest in large groups known as arribadas. They are small like the Olive Ridely and have and oval shell. Like the Olive Ridley, Kemp's Ridley turtles have asymmetrical tracks of about the same average width of 70-80cm. Again, like the Olive Ridley, Kemp's Ridley sea turtles tend to nest during the day. They love to hang out in places with muddy, sandy bottoms where they can find their favorite food of crustaceans and molluscs.